Published: Jan. 23, 2019 at 02:37 p.m. Updated: Jan. 26, 2019 at 08:58 p.m.
2019 Pro Bowl week is under way in Orlando! Take a look at some of the best moments leading up to Sunday's AFC and NFC all-star matchup. 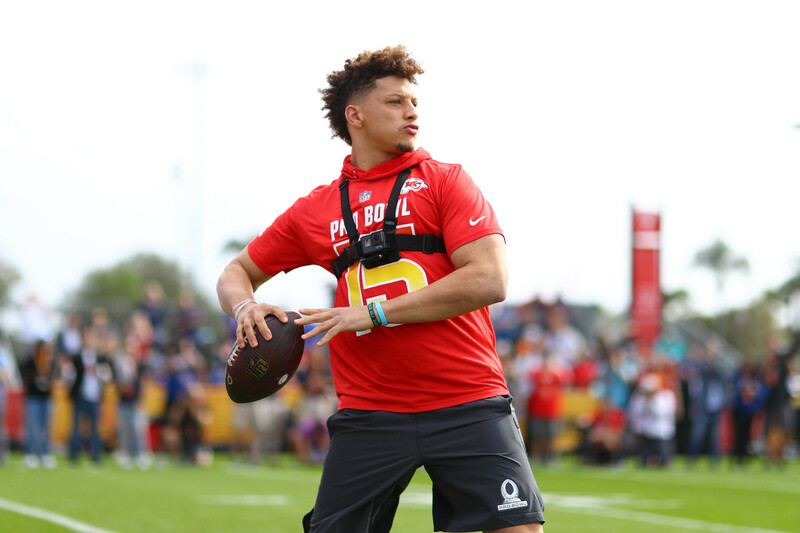 Kansas City Chiefs quarterback Patrick Mahomes (15) is seen during practice for the 2019 Pro Bowl, Wednesday, Jan. 23, 2019 in Orlando, Fla.
Los Angeles Chargers running back Melvin Gordon (28) is seen during practice for the 2019 Pro Bowl, Wednesday, Jan. 23, 2019 in Orlando, Fla.
NFL Pro Bowl Cheerleaders from the Cincinnati Bengals, Los Angeles Rams, San Francisco 49ers, and Kansas City Chiefs pose for photos, Tuesday, Jan. 22, 2019, in Orlando, Fla.
Seattle Seahawks quarterback Russell Wilson (3) and pop singer Ciara are seen during practice for the 2019 Pro Bowl, Wednesday, Jan. 23, 2019 in Orlando, Fla.
Kayla from the Philadelphia Eagles poses for photos, Tuesday, Jan. 22, 2019, in Orlando, Fla.
Jacksonville Jaguars cornerback Jalen Ramsey (20) is seen during practice for the 2019 Pro Bowl, Wednesday, Jan. 23, 2019 in Orlando, Fla.
Denver Broncos outside linebacker Von Miller (58) and running back Phillip Lindsay (30) are seen during practice for the 2019 Pro Bowl, Wednesday, Jan. 23, 2019 in Orlando, Fla.
NFL Pro Bowl Cheerleaders from the Los Angeles Chargers and Philadelphia Eagles pose for photos, Tuesday, Jan. 22, 2019, in Orlando, Fla.
Green Bay Packers wide receiver Davante Adams (17) is seen during practice for the 2019 Pro Bowl, Wednesday, Jan. 23, 2019 in Orlando, Fla.
New York Giants defensive back Michael Thomas (31) is seen during practice for the 2019 Pro Bowl, Wednesday, Jan. 23, 2019 in Orlando, Fla.
Megan from the New Orleans Saints poses for photos, Tuesday, Jan. 22, 2019, in Orlando, Fla.
Dallas Cowboys wide receiver Amari Cooper (19) is seen during practice for the 2019 Pro Bowl, Wednesday, Jan. 23, 2019 in Orlando, Fla.
Lexie from the Indianapolis Colts poses for photos, Tuesday, Jan. 22, 2019, in Orlando, Fla.
Los Angeles Chargers free safety Derwin James (33) is seen during practice for the 2019 Pro Bowl, Wednesday, Jan. 23, 2019 in Orlando, Fla.
NFL Pro Bowl Cheerleaders from the Washington Redskins and Dallas Cowboys pose for photos, Tuesday, Jan. 22, 2019, in Orlando, Fla.
Kansas City Chiefs wide receiver Tyreek Hill (10) is seen during practice for the 2019 Pro Bowl, Wednesday, Jan. 23, 2019 in Orlando, Fla. Fans are seen during practice for the 2019 Pro Bowl, Wednesday, Jan. 23, 2019 in Orlando, Fla.
NFL Pro Bowl Cheerleaders from the San Francisco 49ers, Los Angeles Chargers, and Washington Redskins pose for photos, Tuesday, Jan. 22, 2019, in Orlando, Fla.
New York Giants running back Saquon Barkley (26) is seen during practice for the 2019 Pro Bowl, Wednesday, Jan. 23, 2019 in Orlando, Fla.
Minnesota Vikings outside linebacker Anthony Barr (55) and defensive end Danielle Hunter (99) are seen during practice for the 2019 Pro Bowl, Wednesday, Jan. 23, 2019 in Orlando, Fla.
Lacey from the Dallas Cowboys poses for photos, Tuesday, Jan. 22, 2019, in Orlando, Fla.
New Orleans Saints defensive end Cameron Jordan (94) is seen during practice for the 2019 Pro Bowl, Thursday, Jan. 24, 2019 in Orlando, Fla.
NFL Pro Bowl Cheerleaders from the Los Angeles Chargers, Arizona Cardinals, Dallas Cowboys, Tennessee Titans, Miami Dolphins, New England Patriots, Baltimore Ravens, Seattle Seahawks, and Carolina Panthers pose for photos, Tuesday, Jan. 22, 2019, in Orlando, Fla.
Chicago Bears cornerback Kyle Fuller (23), center Cody Whitehair (65), quarterback Mitchell Trubisky (10), offensive tackle Charles Leno Jr. (72), defensive end Akiem Hicks (96), free safety Eddie Jackson (39), and running back Tarik Cohen (29) are seen during practice for the 2019 Pro Bowl, Thursday, Jan. 24, 2019 in Orlando, Fla.
Dallas Cowboys quarterback Dak Prescott (4) is seen during practice for the 2019 Pro Bowl, Thursday, Jan. 24, 2019 in Orlando, Fla.
New Orleans Saints defensive end Cameron Jordan (94) and Dallas Cowboys running back Ezekiel Elliott (21) are seen during practice for the 2019 Pro Bowl, Thursday, Jan. 24, 2019 in Orlando, Fla.
Chicago Bears quarterback Mitchell Trubisky (10) is seen during practice for the 2019 Pro Bowl, Thursday, Jan. 24, 2019 in Orlando, Fla.
New Orleans Saints running back Alvin Kamara (41) is seen during practice for the 2019 Pro Bowl, Thursday, Jan. 24, 2019 in Orlando, Fla.
Dallas Cowboys outside linebacker Leighton Vander Esch (55) is seen during practice for the 2019 Pro Bowl, Thursday, Jan. 24, 2019 in Orlando, Fla.
NFL Pro Bowl Cheerleaders from the New Orleans Saints, Tampa Bay Buccaneers, Cincinnati Bengals, Los Angeles Chargers, and San Francisco 49ers pose for photos, Tuesday, Jan. 22, 2019, in Orlando, Fla.
NFL Pro Bowl Cheerleaders from the Dallas Cowboys, Miami Dolphins, and New England Patriots pose for photos, Tuesday, Jan. 22, 2019, in Orlando ,Fla.
Dallas Cowboys head coach Jason Garrett is seen during practice for the 2019 Pro Bowl, Thursday, Jan. 24, 2019 in Orlando, Fla. Fans are seen during practice for the 2019 Pro Bowl, Thursday, Jan. 24, 2019 in Orlando, Fla.
Minnesota Vikings wide receiver Adam Thielen (19) is seen during practice for the 2019 Pro Bowl, Thursday, Jan. 24, 2019 in Orlando, Fla.
NFL Pro Bowl Cheerleaders from the (from top left to top right) New Orleans Saints, Tampa Bay Buccaneers, Detroit Lions, Carolina Panthers, Atlanta Falcons, San Francisco 49ers, Philadelphia Eagles, (from bottom left to bottom right) Arizona Cardinals, Seattle Seahawks, Minnesota Vikings, Washington Redskins, and Dallas Cowboys pose for photos, Tuesday, Jan. 22, 2019, in Orlando, Fla.
Indianapolis Colts quarterback Andrew Luck (12) is seen during practice for the 2019 Pro Bowl, Wednesday, Jan. 23, 2019 in Orlando, Fla.
Minnesota Vikings defensive end Danielle Hunter (99) is seen during practice for the 2019 Pro Bowl, Thursday, Jan. 24, 2019 in Orlando, Fla.
NFL Pro Bowl Cheerleaders from the Detroit Lions, Washington Redskins, Denver Broncos, New York Jets, Houston Texans, Los Angeles Chargers, Dallas Cowboys, and Arizona Cardinals pose for photos, Tuesday, Jan. 22, 2019, in Orlando, Fla.
Chicago Bears running back Tarik Cohen (29) is seen during practice for the 2019 Pro Bowl, Wednesday, Jan. 23, 2019 in Orlando, Fla.
New York Giants running back Saquon Barkley (26) and New Orleans Saints running back Alvin Kamara (41) are seen during practice for the 2019 Pro Bowl, Friday, Jan. 25, 2019 in Orlando, Fla.
New York Giants running back Saquon Barkley (26) is seen during practice for the 2019 Pro Bowl, Friday, Jan. 25, 2019 in Orlando, Fla.
Jacksonville Jaguars defensive end Calais Campbell (93), and cornerback Jalen Ramsey (20) pose for a photo during practice for the 2019 Pro Bowl, Friday, Jan. 25, 2019 in Orlando, Fla.
Los Angeles Chargers defensive back Adrian Phillips (31), running back Melvin Gordon (28), wide receiver Keenan Allen (13), free safety Derwin James (33), defensive end Melvin Ingram (54) pose for a photo during practice for the 2019 Pro Bowl, Friday, Jan. 25, 2019 in Orlando, Fla.
Seattle Seahawks quarterback Russell Wilson (3), Dallas Cowboys quarterback Dak Prescott (4), Chicago Bears quarterback Mitchell Trubisky (10) is seen during practice for the 2019 Pro Bowl, Friday, Jan. 25, 2019 in Orlando, Fla.
Indianapolis Colts tight end Eric Ebron (85), quarterback Andrew Luck (12), offensive guard Quenton Nelson (56) are seen during practice for the 2019 Pro Bowl, Friday, Jan. 25, 2019 in Orlando, Fla.
NFC Pro Bowl team photo is seen during practice for the 2019 Pro Bowl, Friday, Jan. 25, 2019 in Orlando, Fla.
Chicago Bears quarterback Mitchell Trubisky (10) is seen during practice for the 2019 Pro Bowl, Friday, Jan. 25, 2019 in Orlando, Fla.
A fan competes in a skills challenge during the NFL Experience, Saturday, Jan. 26, 2019 in Orlando, Fla.